Two major schemes directed towards providing the cities of Al-Khobar and Dammam, an area with around 300,000 inhabitants, with potable water supply, sewerage and sewage disposal. The inadequate and objectionable conditions regarding transport of water by tankers and disposal of sewage by septic tanks or surface drainage were to be replaced by modern and hygienic systems. 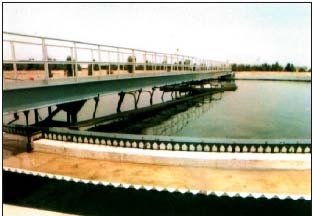 Wastewater treatment facilities including screening, de-gritting, complete mix activated sludge extended aeration system with vertical carousel aerators 110 kw each, together with tertiary treatment and effluent reuse for irrigation purposes.